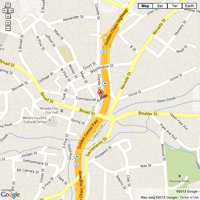 Get driving directions to Nevada City, California. Nevada City is located at the 2,500-foot elevation on the forested western slope of the Sierra Nevada in Northern California. From Sacramento, it’s a one-hour drive via eastbound Interstate 80 and northbound Highway 49. Nevada City is 90 minutes from Reno and 50 minutes from Truckee via westbound I-80 and Highway 20. Nevada City is the prettiest and most interesting of California Gold Rush towns. After more than a century of pioneer heritage, Nevada City remains the most complete gold town in California. It is both a genuine small town and living museum. 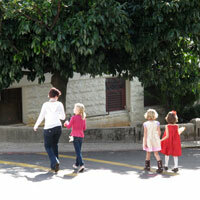 Today, visitors enjoy exploring the town’s narrow streets and century-old buildings. 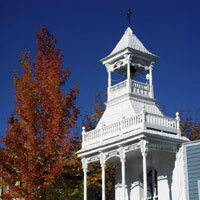 Nevada City is filled with beautiful trees and now you can learn about them through “The Nevada City Tree Tour.” The self-guided walking (or driving) tour of 42 native and non-native trees in the downtown Nevada City area is available online as a downloadable PDF, Google Earth and Google Map. Come by the Chamber office to get a postcard to share this tour with your friends and family! 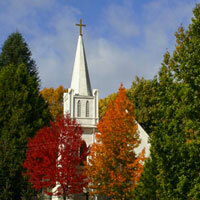 The Nevada City fall colors map shows a self-guided tour to some of the townʼs best fall color areas. The tour takes about 15 minutes by car, longer for cyclists or energetic walkers. 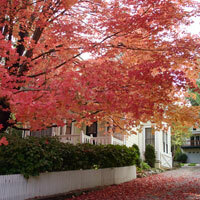 Nevada Cityʼs best fall colors are in historic residential neighborhoods. Many of these trees were planted by early settlers. If you need a small map to print and put in your pocket while you’re wandering around town, download our .pdf of the main streets in the downtown area, and Seven Hills Business District. Discover the historical treasures in Nevada City. Wander into the National Hotel, the state’s oldest, continuously-operated hotel. Walk by the Sargent House on Broad Street, built in 1856 by civic leader and former U.S. Senator Aaron A. Sargent. Find the old Firehouse No. 2, featured in many photos of Nevada City. 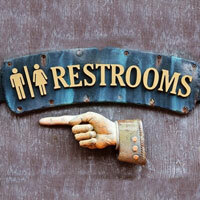 There are a number of public restrooms in the downtown Nevada City area, including one in the Nevada City Chamber of Commerce office. For hours and locations, see the list below. National Geographic’s Geotourism Map Guide, the source of California and Nevada’s indomitable spirit and unparalleled explorations. 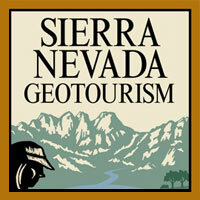 Use the Sierra Nevada print map to guide you through breathtaking landscape, local culture, and unforgettable vacations. Download the printable .pdf below.